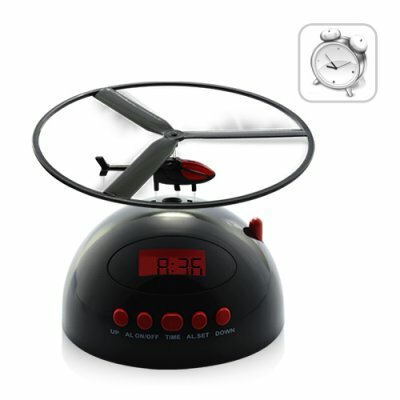 Successfully Added Flying Alarm Clock (Airwolf Edition) to your Shopping Cart. Your son is always late for school because he hates getting up in the morning. If this goes on, he'll be kicked out of school and will be a homeless person for the rest of his life. Your husband is always late for work because he just keeps hitting the snooze button. If this keeps up, he'll lose him job, the bank will take back the house and your family will be homeless for the rest of your lives. Or you could buy this amazingly well-made and durable flying alarm clock and live a great life. Picture this: When this alarm clock goes off, the tiny helicopter propeller starts to whirl and next thing you know, the helicopter launches into the air and flies aimlessly around the room -- where it lands no one knows and that's the beauty of this flying alarm clock. Until the helicopter is found and inserted back into the base, this ultra annoying alarm will keep sounding...for the next 10 awful minutes! The sleeper will be so annoyed that he or she will grumpily get out of bed, bump their knee or stub their toe on a chair, swear profusely, spend hapless minutes looking for that damn helicopter in order to shut the alarm off - by then they're wide awake and ready to face another beautiful day! Aside from the flying helicopter attachment, this flying alarm clock works just like a normal alarm clock. Conveniently set the time, set the alarm, and wake up on time! It's the perfect gift for your sleepyhead son, daughter, husband, wife, co-worker, employee, boss, geek-friend, hipster buddy, friend with benefits, or any of the people in your life you care about. Wakes up even the sleepiest sleepers! Primary function: alarm clock of last resort for those on the verge of losing their jobs due to tardiness. Another innovative feature of this flying alarm clock is the battery chamber. It requires a screw to open so that angry sleepers aren't able to shut off the alarm simply by removing the batteries. Dear Resellers and Dropshippers: please google "flying alarm clock" and see how much this product is being sold for online. In most cases, the markup is 300-400%. Even if you sell it for a 200% markup, you'll still undercut your competition and make tons of money in the meantime. How cool is this flying alarm clock? This flying alarm is so cool, it was originally designed to wake up Chuck Norris. No seriously, how cool is this flying alarm clock? This flying alarm is so cool, it beat the snot out of Scott Pilgrim.